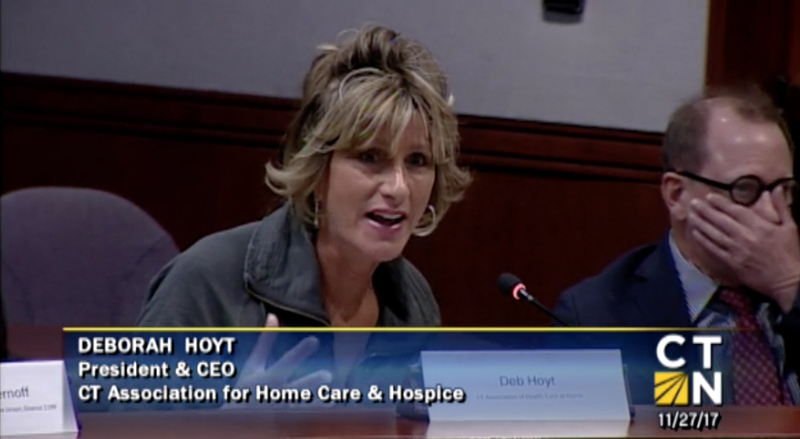 Deborah Hoyt, Association President and CEO presented an overview of the licensed home health and hospice industry at the January 10, 2019 CT Medicaid Innovation Public Forum hosted by Legislative Human Services Committee Co-Chairs, State Rep. Catherine Abercrombie and Senator Marilyn Moore. The forum was open to the public and all state legislators to learn about the CT Medicaid program, the provider network, its scope of services and economic impact. Various speakers offered innovative concepts to enhance care delivery and drive cost savings. View the full 2 hour and 21 minute event here. Congratulations to Rhode Island for recognizing the need to “catch up” reimbursement rates to its home health providers with a 29 percent rate increase to sustain Medicaid client access to care as well as continue their state Medicaid cost per client savings trend. Connecticut would be wise to follow this example as the situation here has become unsustainable for providers. The State of CT is finally recognizing the value of healthcare provided by home care workers. Our local VNAs and other Medicaid home health agency providers and their 19,000 employees have saved the State general fund $103-Million each year for the past 11 years, totaling $1.3-Billion in savings, according to DSS reports. However, not all home-based care workers are the same. More importantly, the source of funding to pay home-based worker wages are not the same. Listen to Deborah Hoyt, President and CEO of the CT Association for Healthcare at Home in an interviewed with Merrily Orsini as part of a podcast series, “Help Choose Home” sponsored by the National Association for Home Care and Hospice (NAHC). Learn about the shift in decision-making by physicians, hospitals, insurance companies and government programs including Medicare and Medicaid that are making “home” the desired setting for care for our aging population and those with chronic conditions. Home-based care has proven to be patient-preferred, cost-effective, high quality and most importantly, keeps families together when a loved one is experiencing ongoing care needs. Nov. 27, 2017 CT Long Term Care Advisory Council. End of Life Care in the US. Home health care agencies around the state appear to be in jeopardy because of the continued state budget stalemate at the Capitol. Licensed Home health nursing care is designed to save the state money by keeping the chronically ill Medicaid population out of costly Emergency Rooms and Nursing Homes. The State’s home health industry saves the State budget $103-Million per year on average,a state budget savings that is in jeopardy as home health agencies begin to limit access, close their doors,and discharge Medicaid clients due to 10 years of inadequate reimbursement rates. If Connecticut residents are wondering what Connecticut’s “secret sauce” is to rank us tops in efficient Medicaid spending, it’s a combination of Inadequate and flat Medicaid reimbursement to home health providers, a State Plan Amendment cutting Medicaid behavioral home health nursing rates by 15 percent and other factors -- all at the suffering and demise of our Medicaid provider community. The Governor’s Executive Order calls for a 5-10% reimbursement cut to non-profits as well as eliminating “add-on” payments to Medicaid home health providers serving the State’s most vulnerable in our inner cities.